Early in 1930, the Peninsular and Oriental Steam Navigation Company ordered the two "White Sisters" Strathnaver and Strathaird. These two ships differed from anything seen before from P&O; they set the style and standards for all the future P&O mail steamers right up to the Canberra in 1961. At 22,540grt, they were the largest ships to be built for the company at that time. On 23rd April, 1930, at the Barrow-in-Furness yards of Vickers Armstrong Ltd, Strathaird's keel was laid, and designated yard number 664. She was launched on the 18th July, 1931, by Lady Margaret Shaw, the daughter of P&O's chairman, Lord Inchcape, and the wife of Mr Alexander Shaw who was to be the next Chairman of the company. Strathaird's name was derived from the title of Sir William Mackinnon, the founder of the British India Company, and was the name of a headland on the Island of Skye. 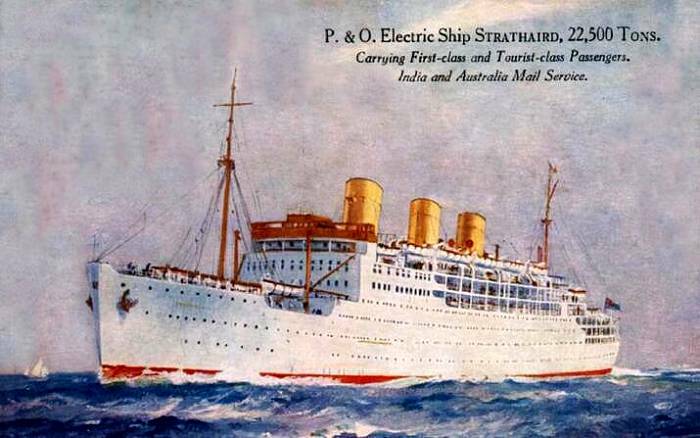 Strathaird was handed over to P&O on 10th January, 1932, the second of the five sister ships of the 'Strath Class'. Prior to Strathnaver and Strathaird, all P&O's steamships had black-painted hulls and funnels. 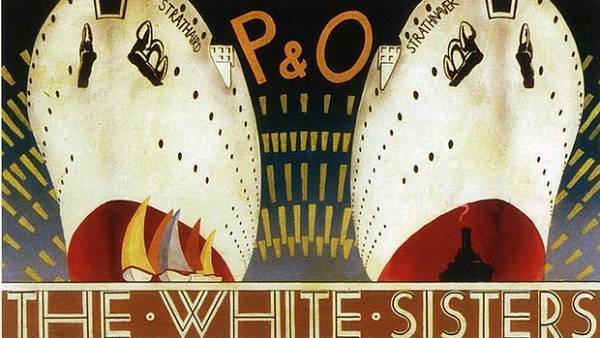 With their splendid new livery of white hulls and buff funnels, the new ships earned many sobriquets, including: The White Sisters, The Strath Sisters, and so on. It was ex­tremely successful for the company's ships as they spent a great deal of time voyaging in tropical waters. In addition, this was only the second time that P&O had given its ships three funnels - the first being Naldera and Narkunda in 1918 and 1920. British public opinion in the early 1930s, tended to judge the power and safety of a ship by the number of its funnels. Entering Company service during the Great Depression, there is no doubt that the introduction of The White Sisters, lifted the spirits of a nation worn down by economic misery. "While any tendency to elaboration or ornateness has been obviated, the styles of decoration and furnishing are always pleasing and effective...."
Strathaird and Strathnaver bore all the characteristics of sister ships. Each had four water-tube boilers and two auxiliary boilers. Following the success of the Company's first large turbo-electric liner, the Viceroy of India, the Company selected the same innovative propulsion system for Strathnaver and Strathaird, giving them some three knots over their illustrious predecessor. In the early 1930s they were the largest British-built turbo electric ships. The boilers had a combined heating surface of 56,000 square feet (5,203 m2) and supplied steam at 425 lbf/in2 to two turbo generators. These supplied current to two electric motors with a combined rating of 6,315 NHP or 28,000 shp. British Thomson-Houston of Rugby, Warwickshire built the turbo-generators and motors. The motors drove a pair of inward-rotating screw propellers. 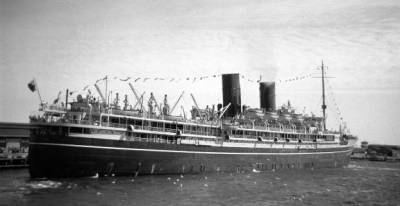 Strathaird left Tilbury on her maiden voyage on 12 February 1932, calling at Port Said, Aden, Bombay, Colombo, Fremantle, Adelaide, Melbourne and Sydney. She would later take her share of cruise duties, with many of her country men and women enjoying their introduction to cruising aboard her, especially in the tourist class. It was whilst Strathaird was on a Mediterranean cruise, at 5.50am on 19th June, 1936, that she travelled along the central line of a total eclipse of the sun, while she was cruising between Corfu and Athens and off the island of Hydra. Strathaird and Strathnaver were each equipped with DF - direction finding equipment, an echo sounder and a gyrocompass As built, Strathaird had accommodation for 498 first class and 670 tourist class passengers. 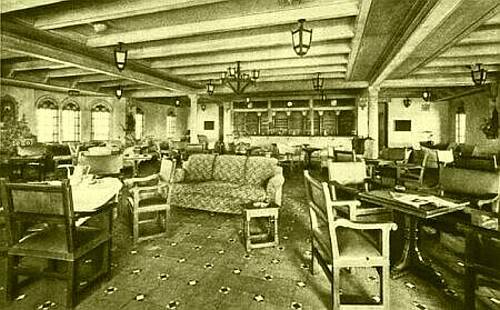 With her well appointed public rooms, her decor was very much of the period, modern and contemporary, and admired by both first and tourist class passengers. 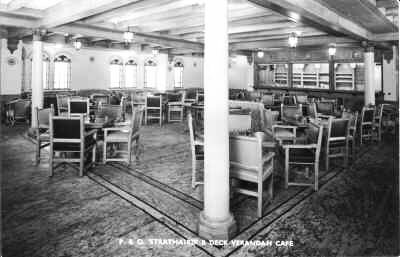 P&O was keen to reflect its national identity in the interior designs of its ships, and it is acknowledged that Strathnaver and Strathaird were the first ships to incorporate and exploit this sense of national pride. 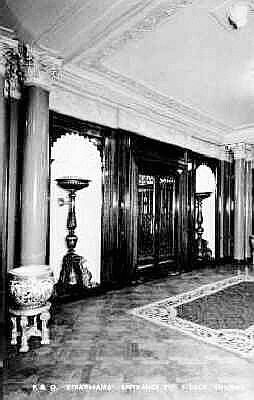 The interior design of the ships displayed themes of art deco and period style, a look which had become a P&O house style since the Viceroy of India, and were the overall responsibility of the chairman's wife, Lady Inchcape, and her daughter, Lady Margaret Shaw. The first class writing room of Strathaird was gently Queen Anne in styling, complete with decorative plasterwork on the ceiling, English cedar panelling, walnut furniture and Turkish rugs. To enhance the effect, natural light was filtered by means of leaded windows, decorated with stained glass. 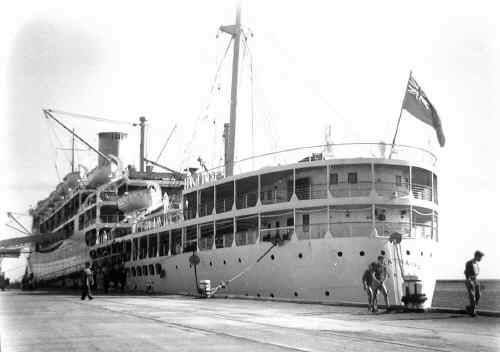 Strathnaver and Strathaird brought new standards of luxury to the Australian service. 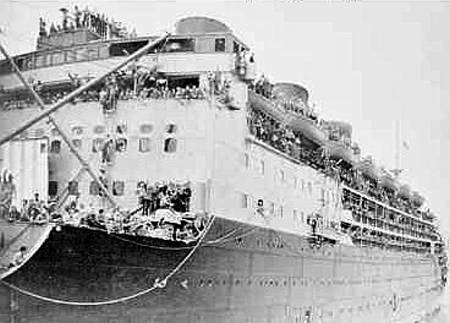 There were eight passenger decks, from 'A' deck down to 'H' deck. 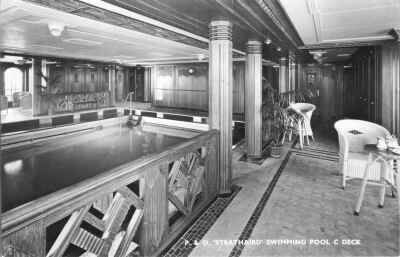 'A' deck, which was also the boat deck, was exclusively the first class sun and sports deck. 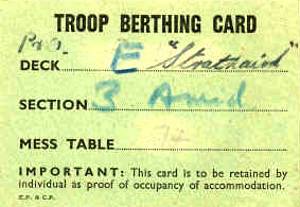 'B' deck was again exclusively first class; here could be found the public rooms for that class. 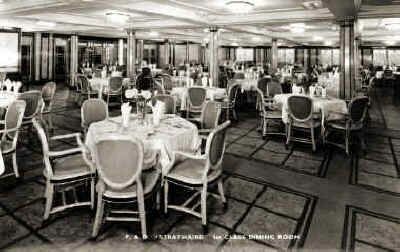 Right forward on this deck was the main lounge, with a veranda lounge on either side. 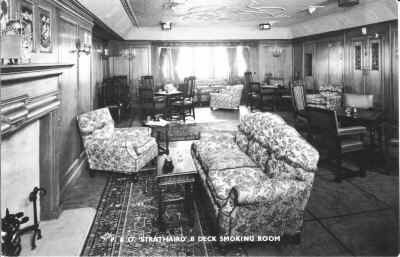 Aft of this was the smoking room and next to this, on the starboard side, the reading and writing room. Then came the dancing space and, aft of that, two corridor lounges and the veranda cafe. Right aft on this deck was the children's nursery and playground area. 'C' deck was again exclusively first class, mainly taken up with cabins, many of these being single berth. Right aft was the swimming pool. 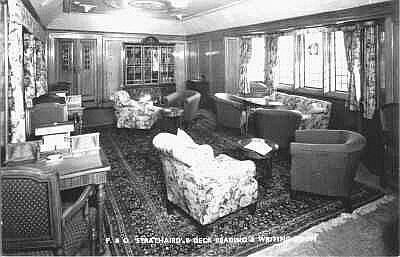 'D' deck forward was an open deck for the first class and amidships were first class cabins, which included six staterooms. 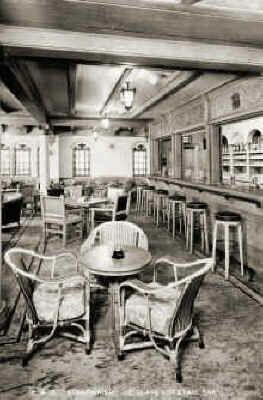 Further aft this deck opened out to the tourist sports and sun deck, with the veranda cafe and swimming pool. Right aft were the passengers' hospitals. On 'E' deck, amidships, were first class cabins, again many of them being single berth. Further aft was the tourist class dance space, lounge, children's nursery and playground. The dining saloons for both classes were on 'F' deck, the first class saloon amidships and the tourist class aft of it, with the galley situated between them. 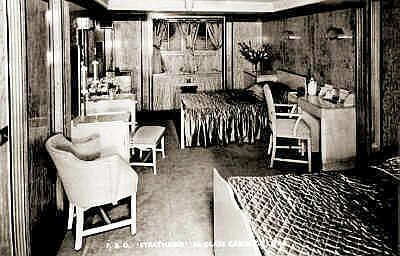 Forward of the first class saloon were more first class cabins and aft of the tourist class saloon was the tourist smoking room. Right aft on this deck was the laundry. 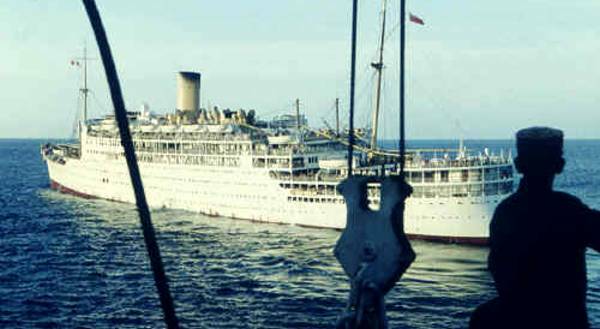 Passenger accommodation on 'G' and 'H' decks was aft and consisted of tourist class cabins. Please Note: I hold copies of all Strathaird's deck plans - please email me if you require them. 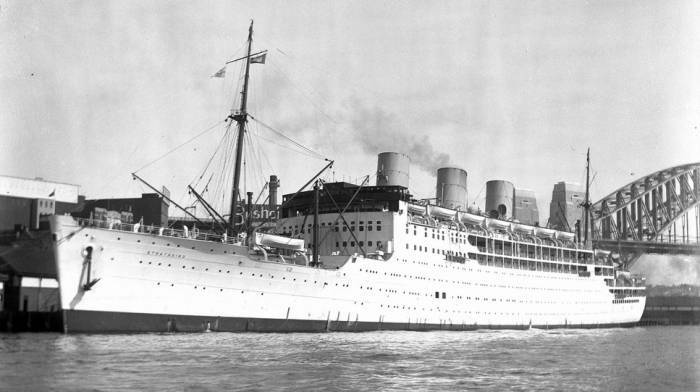 P & O became the first major world shipping company to operate cruises out of Australia and on Friday December 23, 1932, with 1,100 passengers embarked, Strathaird became the very first large liner to operate a cruise as she slipped past Sydney Heads, and headed for Norfolk Island on a five day Christmas cruise. 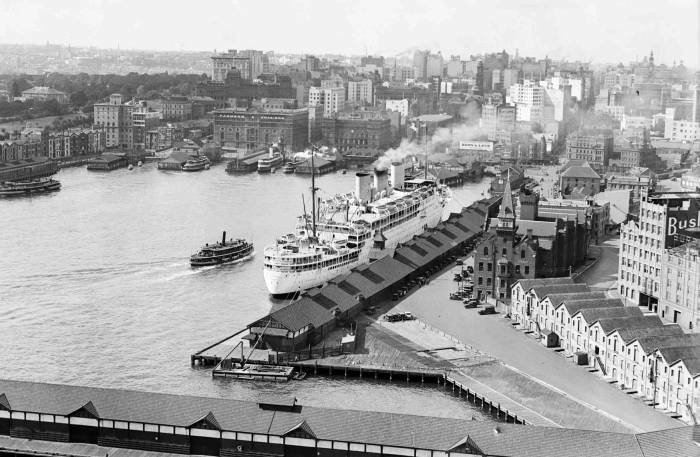 Departing Sydney on P&O's inaugural Australian cruise, Friday December 23, 1932. 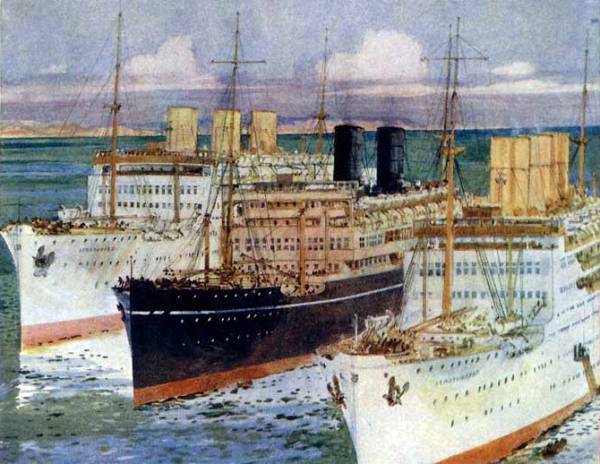 "As she inched slowly away from the berth, the departure of P&O's new gleaming-white ship, RMS Strathaird, heralded the beginning of a new era, though few of the hundreds of people lining the ship's rails or waving from the shore realised the magnitude of the occasion. Strathaird was sailing away for a five-night cruise with just two ports of call - Brisbane and Norfolk Island. 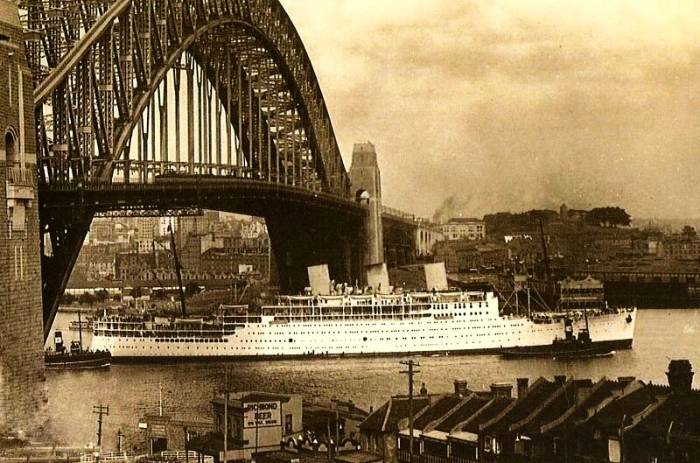 It was the beginning of P&O Cruises' first cruise from Australia and was one of the world's first cruises. Two of the passengers on that first cruise were Isobel Bennett a distinguished marine zoologist, and her sister, Jean. "Christmas Day at sea was just fantastic," she recalls. "There was much celebrating, beginning with a carol service and the highlight was dinner with all the trimmings. Tables were laden with food, the boar's head, the pheasants - it was superb. We had lots of activities during the cruise including deck games, fancy dress ball, dancing every night." Miss Bennett clearly remembers the call at Norfolk Island. "The splendid Norfolk Island Pines were still there - later to be cut down for the building of the airstrip. It was a big occasion for the island - they had never before been visited by such a big ship," she says. 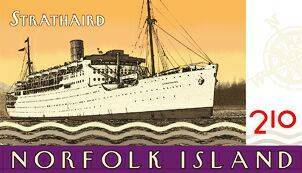 "Strathaird stood off the port and we were ferried ashore by the ship's lifeboats. We visited the little church built by the Melanesian missionaries, which is still one of the island's attractions." In March 2010, the island's authorities created a stamp in honour of Strathaird's 1932 visit. The main attraction of cruising in the 1930s was the experience of being on a big ship. 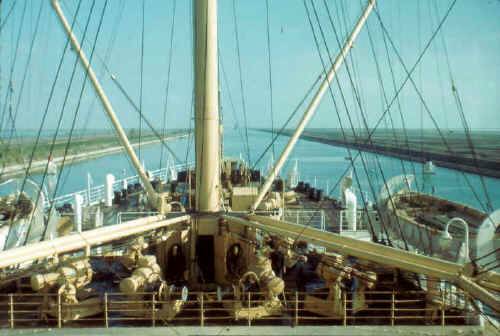 In those days, the only way to enjoy an experience of this kind was to travel from Australia to overseas ports, usually to England via the Suez Canal. 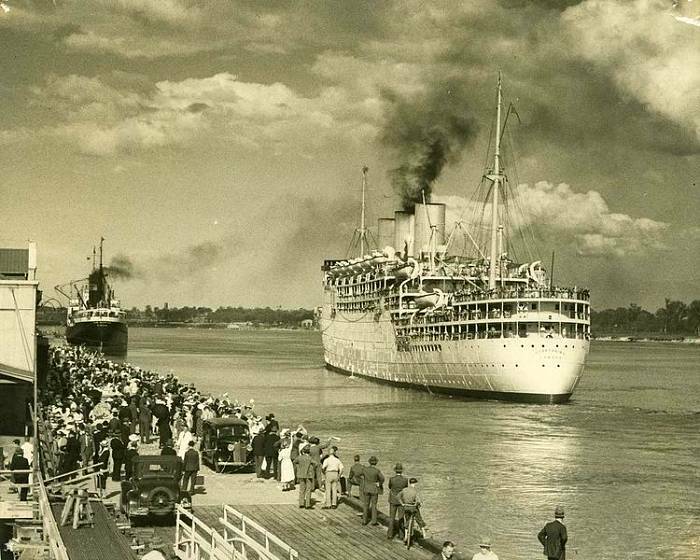 As Australia's coastline was serviced by smaller ships, unless they had done the 'big trip overseas', many Australians had never been on an ocean liner before. 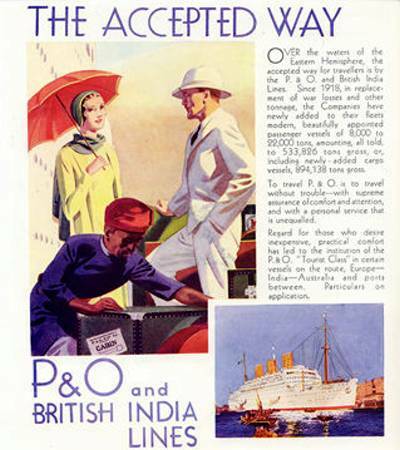 P&O were to change all that on 23rd December 1932. Strathaird's Christmas cruise was the exciting beginning of a new type of holiday experience for Australians. Incredibly, the ship was fully booked three days after the cruise was advertised. Encouraged by this eager and positive response, P&O developed a program of cruising holidays throughout the 1930s, to cater to the growing cruising market in Australia, which still exists to this day. 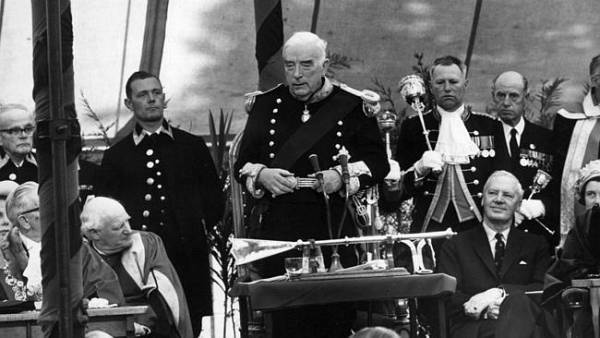 Robert Menzies was forty before he visited England for the first time in 1934, five years before the commencement of his first term as Australia's Prime Minister. 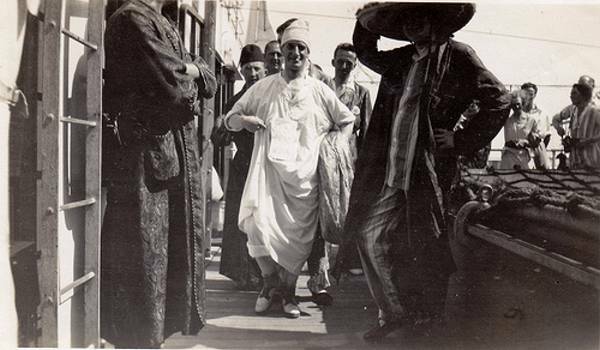 He went as a member of the Australian delegation attending King George V's Silver Jubilee. 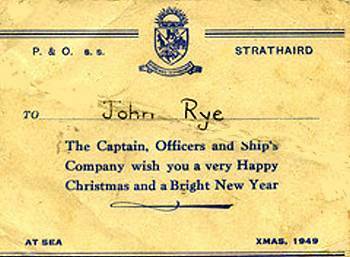 Sailing in the Strathaird, past the coast of Africa and through Aden on its fourth voyage to England from Australia, he wrote in his diary: "Further reflections on the persistent Englishness of the English: Here is a golf course, there is a soccer football ground... The more I see of such people, the more satisfied I am that while doctrinaires and theorists speculate about self-government for natives, the British calmly go on their way giving to these people what obviously they could never give to themselves". 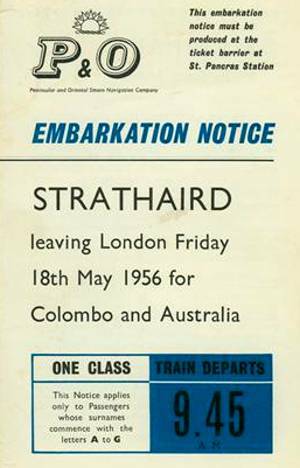 And when the Strathaird reached its destination: "At last we are in England, our journey to Mecca has ended, and our minds abandoned to those reflections which can so strangely (unless you remember our traditions and upbringing) move the souls of those who go 'home' to the land they have never seen." On arriving, he revelled in the sights and sounds of the centre of Empire and the peace and harmony of the English countryside, discovering the places he began reading about as a schoolboy in Jeparit, on the Wimmera River in Western Victoria. 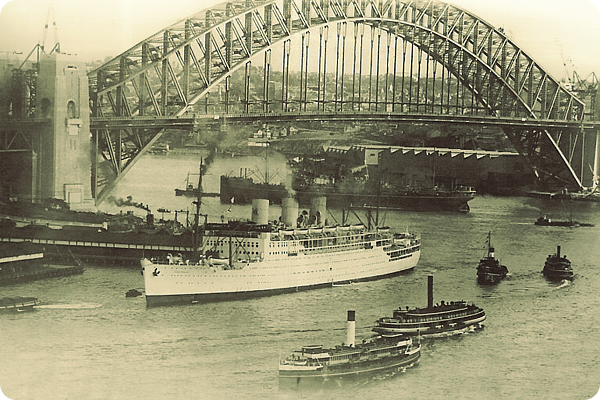 Strathaird, sun-dappled in her heyday, passing under the Sydney Harbour Bridge. 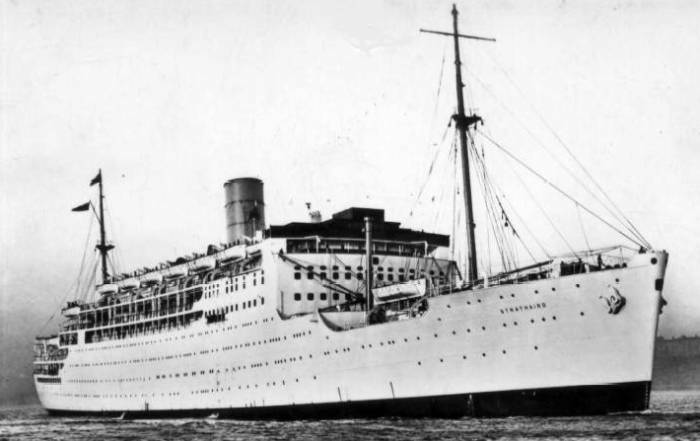 On the outbreak of the Second World War, whilst the smaller P&O liners were requisitioned for service as armed merchant cruisers, the size and speed of Strathnaver and Strathaird suited them for conversion to troopships. Both ships were taken over by the Ministry of War Transport and were refitted and converted for their new role in Liverpool. Their cabin furniture and bulkheads were taken out and replaced with messdecks, hammocks and mess tables, while their hulls and superstructures were repainted in drab wartime grey. Departing Wellington on 5th January 1940, repainted in drab wartime grey. Strathaird in the Mediterranean, en route to Alexandria, with soldiers of the Australian Infantry Brigade embarked. In June, 1940, Strathaird was still being refitted at Liverpool when she was called away and ordered to Brest. When she arrived there, only days before the fall of France, she embarked 6,000 troops and hundreds of civilians, including 200 children. She also took on the gold from British banks in Paris. All of her passengers were landed safely in Plymouth on 18th June. Strathaird was primarily used for trooping duties to Africa and the Middle East. In 1942 she brought US forces across the Atlantic, before being involved in trooping to India from 1942 to 1945. In November 1942, she took part in the Allied landings in North Africa. After the war in Europe had ended, Strathaird was employed repatriating New Zealand Forces back to their homeland. During the war she had steamed 387,745 miles and carried 128,961 personnel. Late in 1946, she went back to the Vickers Armstrong's yard at Barrow, where she was reconditioned ready to resume her civilian service. During refit, her two dummy funnels were removed, which modernised the appearance of the ship and provided her passengers with more open deck space on 'A' deck. Strathaird was the first of the two White Sisters to resume the Australia service in January, 1948. When she left Sydney on 10th March 1948, under the command of Captain H. S. Allan, RD, RNR, it was her first post-war return voyage. She carried with her as passengers the Australian Test Cricket team under their Captain, Don Bradman. 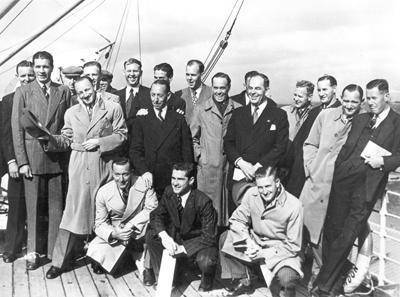 The 1948 Australian Test Team on the deck of Strathaird after their arrival at Tilbury in April 1948. Bradman is in a jocular mood 'tipping his lid'. 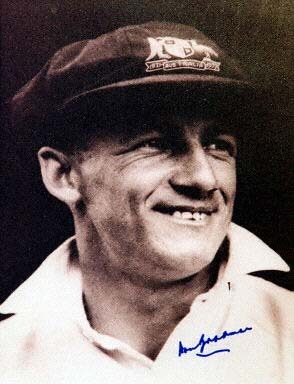 Don Bradman, the Australian cricket captain. The team arrived in Tilbury on 16th April, 1948 to start the 1948 England-v-Australia test series. They won the Ashes 4–0, completed the tour unbeaten, and entered the history books as 'The Invincibles'. Bradman was 40 years of age - remarkable for a first class cricketer. In May 1950, the Strathaird was involved in a collision with the Isthmian Lines 4,705 tonne freighter, Steel Age near Tilbury. Strathaird sustained minor damage. The freighter received damage to plates, frames, brackets and beams, which cost $US 6,122.00 to repair. 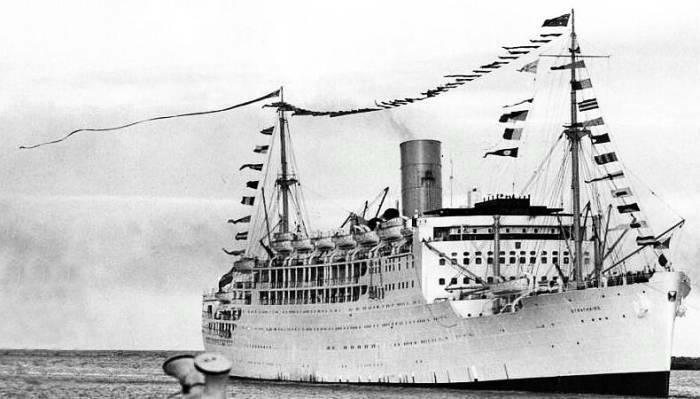 With the arrival of Arcadia and Iberia in 1954, Strathnaver and Strathaird were converted to 'one class tourist ships', carrying 1,200 passengers. 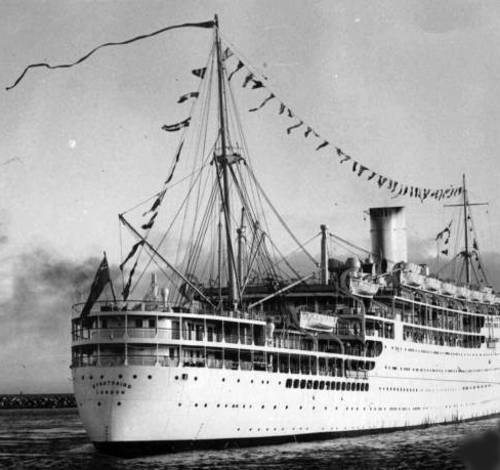 Their conversion coincided with the withdrawal from service and breaking up of the beautiful sister-ships Mooltan and Maloja of 1923 vintage, which had been employed as tourist class ships - mainly carrying migrants from the UK to Australia. On 15th February, 1958 Strathaird made an unexpected call at Djakarta during a voyage home from Australia to evacuate Dutch nationals. 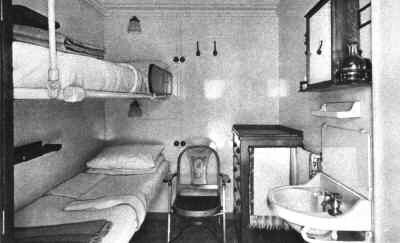 The passengers were moved into the forward accommodation and the refugees were accommodated aft. She disembarked them at Rotterdam on 13th March and arrived at Tilbury on the 14th, just one day late. On 24th June 1959, shortly after leaving Singapore, Strathaird was involved in the dramatic rescue of two airmen from a Tiger Moth plane, which had crashed into the sea. 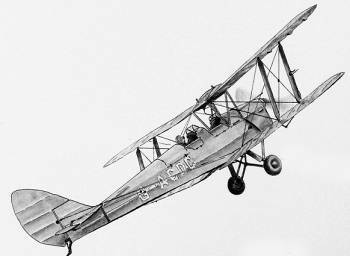 Her Commander, Captain Lethbridge, immediately turned the ship around and as they approached, they spotted two figures sitting on the fuselage. Both accident boats were lowered and the airmen were rescued - as their aircraft sank beneath them. Strathaird berthed at Adelaide in the outer harbour. Strathaird arrives at Tilbury for the last time. 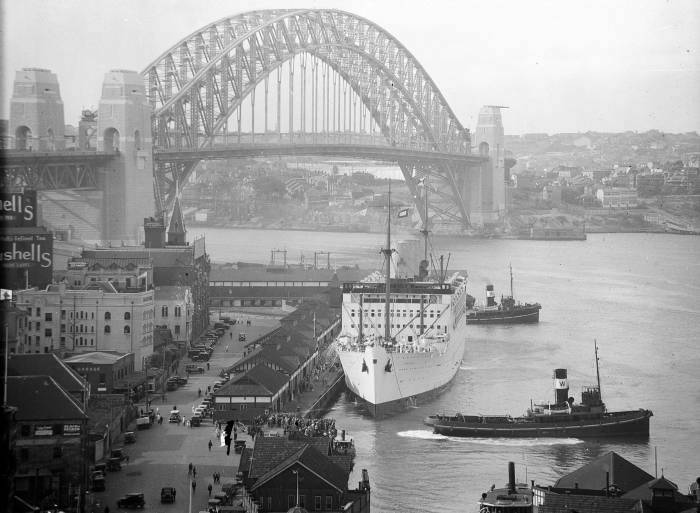 She was given a terrific send-off from each of the Australian ports, where she had become such a familiar sight. 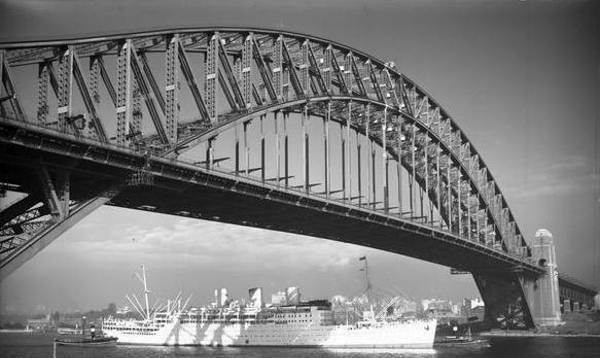 The Perth Daily News of 19th May 1961, recalled that she had been one of the first ships to pass under Sydney Harbour Bridge, while the Adelaide News recalled her first visit in March 1932. In Sydney there was a farewell lunch on board for 150 invited guests. 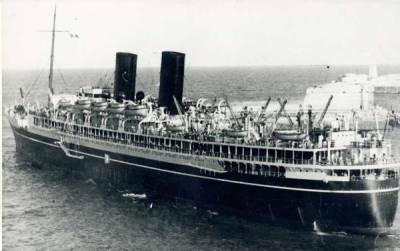 Her withdrawal from service coincided with the introduction of the Company's latest ship, the ss Canberra, and on 8th June, 1961, a dramatic meeting took place in the Mediterranean, near Port Said. The brand new 45,000grt Canberra was on her maiden voyage, outward bound for Australia and New Zealand, with 2,238 passengers embarked, while Strathaird was homeward bound for the very last time. Ship's whistles sounded as the two ships passed, and Captain A. E. Clay, OBE, commanding Strathaird, sent the following signal to Commodore Geoffrey Wild, in command of Canberra, "You look magnificent and all in Strathaird wish you a happy and successful voyage, and from the old to the new, Strathaird bids you farewell." Commodore Wild replied "You too look magnificent with your paying off pennant flying gaily. You look a gracious and not too elderly lady. All well here." All was not well, however, as Canberra was experiencing engine room teething problems: one of the condensers was leeching saline into the distilled water, probably caused by leaky piping. The problem caused her to miss her southbound convoy at Port Said. Strathaird was sold to the Shun Fung Ironworks of Hong Kong for £382,500, and on Saturday 24th June, she left Tilbury for the last time, commanded by Captain D. West. 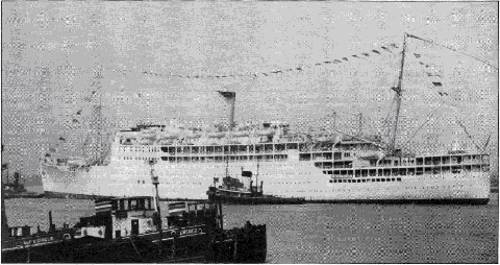 On the 27th July 1961, she was formally handed over to Mr L.Y. Leung at Hong Kong. and in November, P&O announced that her steel was being melted down and re-rolled into reinforcing bars - to be used in the construction of new skyscraper blocks in the colony. The Royal Yacht, Victoria and Albert, passes astern of Strathaird, in the Thames, off Gravesend, Kent.